John Lackey continued his great postseason career, pitching seven innings and giving up one run in the Cardinals 3-1 victory over the Dodgers. 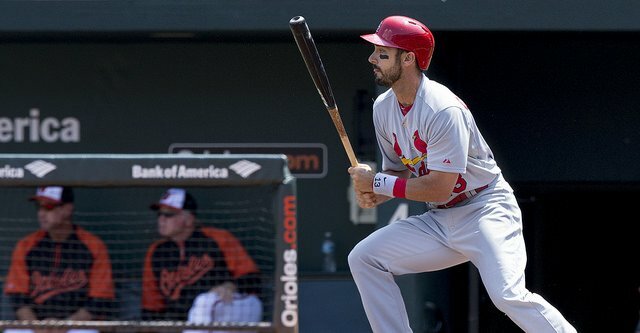 Matt Carpenter hit a home run for the third straight game in the third inning, to give St. Louis an early 1-0 lead. Carpenter is the second player in Cardinal history to homer in three consecutive postseason games, with the other being Albert Pujols. Carpenter only hit eight home runs during the regular season. The only Dodgers run came on a Hanley Ramirez double that drove Yasiel Puig in to tie up the game at one in the sixth inning. Kolten Wong hit a two home run for the Cardinals in the seventh to give them the lead 3-1. Pat Neshek pitched a perfect eight inning for St. Louis, with Trevor Rosenthal closing the door in the ninth. Rosenthal gave up two hits, and said after the game that he was unable to get his footing. It was a rainy night and the grounds crew did what they could to keep the field dry. Hyun-Jin Ryu pitched six innings giving up one runs, and striking out four for Los Angeles. Scott Elbert pitched 2/3 inning gave up three hits, and the home run to Wong. Clayton Kershaw will pitch Tuesday for Los Angeles, as they look to avoid elimination. Last year the Cardinals eliminated the Dodgers in the NLCS, beating Kershaw in game six. Kershaw was knocked out in the fifth, giving up seven runs on seven hits. Kershaw will be pitching on three days rest, the last time he did that was against the Atlanta Braves in last season NLDS. He pitched six innings and gave up two earned runs. Shelby Miller will be on the mound for St. Louis, it will be Miller first postseason start. Game time is at 5:07 p.m. ET on Fox Sports 1.